Happy Chinese New Year to all past, present and future students and their families – Welcome to the Year of the (black water) Snake! 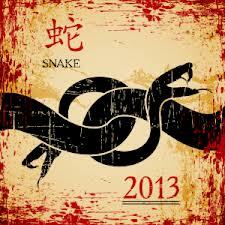 “February 10, 2013 is the first day of the Water Snake (Gui Si) year. However, each animal is also associated with an element. Because Snake is Fire, this is a Water Fire year. The first element (water) symbolizes heaven and spirituality. The second element (fire) symbolizes the physical world, especially the environment and economy. Elements may be either in harmony or conflict. For example, water produces wood. If this year were a water wood year, it would be a good omen. However, water and fire are in conflict because water puts out fire. There will be even more polarization this year between the spiritual and the mundane, between, on the one hand, those fighting for social and environmental justice, and, on the other hand, corporate and governmental powers. Markets and plans will all be unstable, not a good year to take risks, but a good year to move slowly, methodically, and carefully towards your goals. Sometimes water and fire are a dynamic polarity: complementary rather than conflicting opposites. But I do not sense that this is the case for 2013. The elements of the year also effect health. In Chinese medicine, water rules the kidneys; fire rules the heart. The kidneys are adversely affected by a quick pace of life and by stress. Nurture the kidneys by slowing down; mitigate the effects of stress by practicing Tai Chi (taiji quan) and qigong. The heart is damaged by excess (lack of moderation, especially in the emotional realm). Heal the heart by finding mental and emotional equilibrium. Practice peace. The snake is intuitive, energetic, and– no surprise– close to the earth. Among the animals, the snake is the major Chinese symbol of qi, life energy. A great year for wilderness retreats and qigong as well as other yang sheng (life nurturing) activities such as poetry and art”.